After Hewlett-Packard was born in a one-car garage in Palo Alto, California, it took 75 years for it to grow into the global computer behemoth it is today. And since HP set up shop in Chongqing, it has taken the city in Southwest China only a few years to become a global giant in making laptop computers. 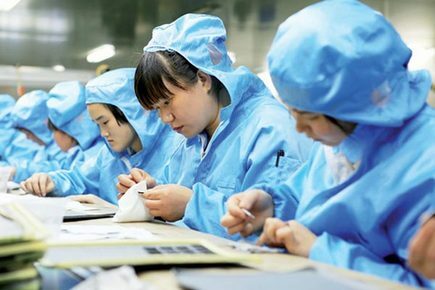 In fact, about one in four laptop computers in the world is now made in Chongqing, 55 million of them in 2013. That was 29.5 percent more than in the previous year, and in the first quarter of last year, 12.43 million laptops were exported from the city, 32.3 percent more than in the previous year. The impressive numbers do not stop there. Apart from HP, four other big global information technology companies have set up factories in Chongqing: Acer Inc, Asus, Toshiba Corp and Sony Corp; six big PC makers, including Foxconn Technology Group, Inventec Corp and Wistron Corp, have operations in the city, having followed in the footsteps of the big five; and also present are 800 companies that sell components to original design manufacturers locally and other technology products, including printers and displays. Chongqing's laptop industry had revenue of 157 billion yuan ($26 billion) in 2013, 38 percent more than the year before, according to Chongqing's Municipal Commission of Economy and Information Technology. Putting all that in context, the PC industry accounted for 10 percent of the city's industrial output in 2013; five years earlier the figure was zero. That is all the more remarkable considering Chongqing's history as a traditional industrial manufacturing city. Chongqing was the capital of the Republic of China during the War of Resistance Against Japanese Aggression (1937-45), and arms manufacturing was an important industry there. It was heavily bombed, and the city became widely known to Chinese as the city of heroes. The city's heavy industry, including mechanics and traditional manufacturing, was founded largely on the city's arms industry. Motor vehicle and motorcycle industries continue to contribute heavily to the city's GDP, and the city is the country's leading motorcycle manufacturer. As car-dependent Detroit in the United States took a lashing during the global economic crises that began to hit in 2008, Chongqing began to look for opportunities in other fields, including electronics. At the same time, electronics manufacturers that were concentrated in coastal areas such as Guangdong province and the Yangtze River Delta were looking to move elsewhere. "There was a shortage of resources in coastal cities," says An Hui, director of CCID Group, a think tank that is part of the Ministry of Industry and Information Technology. "With rapid economic growth in China, the cost of land, electricity and labor in coastal areas was rising. Because of the dearth of labor and high costs, electronics companies were being forced to look to the west." Sniffing the opportunities, Chongqing began courting business by introducing preferential policies such as lower business tax to lure them away from cities such as Suzhou in Jiangsu province. "Relocation very much suited the needs of the western region," An says. At the same time, moving west fitted well with the companies' strategic plans, he says. "The area brought in companies to produce complete laptops, and that attracted businesses that could produce components for the supply chain." The result, he says, can be seen today: a laptop manufacturing center. There are several industrial parks in Chongqing that specialize in electronics manufacturing. Three years after HP arrived in town, Acer Inc, the multinational hardware and electronics maker based in Taiwan, and the fourth largest personal computer seller in the world in 2013, joined it, and its growth since then has been no less remarkable than that of its US rival. Since the first Acer laptop came off the production line in Chongqing in 2011, the plant's contribution to Acer's laptop making has steadily grown. In the first year, laptops made in Chongqing accounted for 20 percent of the laptops Acer made worldwide, says Zhang Yonghong, president of Acer Greater China. This year that figure is expected to be 90 percent. More than 85 percent of Acer laptops made in Chongqing are exported, most going to Europe and the US, he says. The city exported 48.68 million laptops worth $19.8 billion in 2013, almost two-thirds of them to the European Union and North America, the Chongqing Foreign Trade and Economic Relations Commission says. "China is the world's biggest seller of electronic products," An says. "Computer products account for 80 percent of those sales. Among the electronic information manufacture products that China exports, laptops rank second in total value." Chongqing's laptop manufacturing is generally traced back to May 2008 when a representative of the mayor, Huang Qifan, visited HP's headquarters in Palo Alto, California, on a mission to persuade the company to set up a manufacturing base in the Chinese city. HP had set up its first manufacturing plant in China, in Shanghai, 16 years earlier. Chongqing officials argued that as a traditional mechanical manufacturing city, it could provide 80 percent of laptop parts locally, greatly reducing logistics costs. The HP board was won over, and since then HP has invested a lot in Chongqing, says Todd Bradley, the company's executive vice-president. "We've got all kinds of work out there," he says, adding that HP continues to invest in the city as its international capacity, such as logistics, increases. Cui Fuqiu, vice-president of HP China, says: "HP, as the first global leading technology company launched in Chongqing, is working with China's 'Go West' strategy and giving it its backing." Companies are drawn to Chongqing by its business incentives, its healthy labor market, traditional manufacturing capability and growing logistics networks, he says. Zhang of Acer says: "The central government has given its backing to the development of the laptop industry in Chongqing. We benefit from preferential policies. The city also has a manufacturing industrial chain related to making laptops, so we don't need to worry about supplies and the parts we need." Acer's commitment to China includes the intention "gradually to relocate most of the business to the Chinese mainland", he says. He sees human resources as one of Chongqing's main assets. "We pay staff in Chongqing and other places the same wages, and people in Chongqing are happier." The city's developing logistics are also important he says, something echoed by Ke Bin, president of Asus Chongqing. "For inland vendors, the city has unblocked a logistics bottleneck. The railway line connecting the city with Europe has solved transport and logistics problem for IT companies, greatly reducing the waiting time for exports from inland cities. The rail link can cut up to two weeks in shipping goods to Europe. With the speed of change in IT technology, whoever gets a head start will grab the market." The cost of road transport has also been greatly reduced, he says. "The advanced logistics provide the most direct shortcut for global consumers to use the newest technology products as soon as they are available." Asus says that under its plans it will have produced 30 million smart devices in Chongqing by the end of next year and spent $150 million in the five years until then to build a factory where these products can be made. The factory is in the Jiulongpo district high-tech zone. Asus' decision to build its second-largest production center－the biggest is in Shanghai－is linked with Jiulongpo's push to develop a high-tech production center. "As global IT giants have flocked to Chongqing, the city has gained a high international profile in the industry," Ke says. "Chongqing will become the largest domestic electronics export vendor center, and ancillary industries will continue to come in, creating jobs and attracting more talent to the city." Asus is doing some profile building of its own locally as it donates computers to schools, helping them set up digital libraries. It has done this in 50 schools. Cui of HP says the company's customers in central and western China are, with other customers worldwide, playing a pivotal role in the company's fortunes. HP's presence in Chongqing has benefited the company as well as the municipality, he says, creating employment and bringing in global resources and innovative technology. Since HP set up shop in Chongqing, it has taken the city in Southwest China only a few years to become a global giant in making laptop computers.